The 28 Member States of the European Union (EU) agreed that having one single budget to deal with common challenges is cheaper and more effective than tackling these challenges independently. Many achievements of the EU would not have been possible without this common budget. These achievements include: healthier and safer food; new and better roads, railways and airports; a cleaner environment; higher security at the EU’s external borders; studying opportunities abroad; and cultural exchanges. The European Commission, the Council of the European Union, and the European Parliament are all involved in defining the EU budget. The European Commission prepares the draft budget for the following year, and submits it to the Council and the European Parliament before September. Both the Council and the European Parliament can propose amendments. In case of disagreement between the two, a Conciliation Committee is convened with the task of reaching a compromise, which should then be approved by the Council and the European Parliament. The draft budget prepared by the European Commission is based on the Multiannual Financial Framework (MFF) in force. This is a framework defined once every seven years, and represents the European Union’s objectives for the referenced period (e.g. 2014-2020). The MFF sets maximum amounts of spendings and defines the main categories of expenditure. It is not as detailed as the annual budget. The EU budget (€ 146 027 million - blue area) is equal to around 2% of the sum of the 28 Member States’ national budgets (€ 6 607 000 million - orange area). 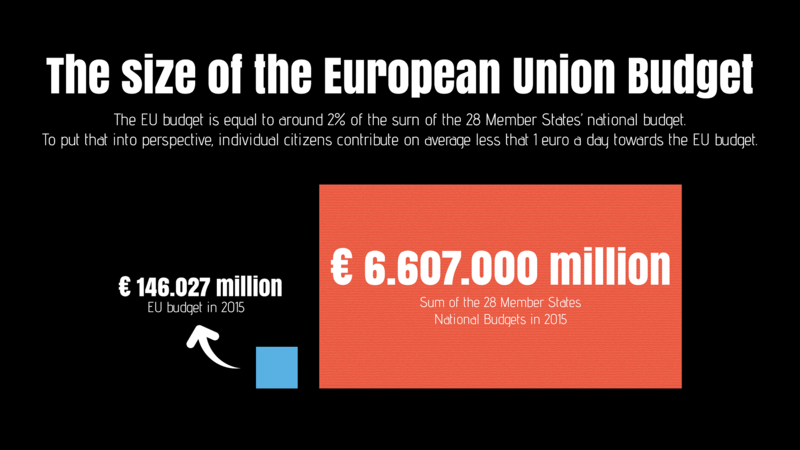 To put that into perspective, individual citizens contribute on average less than 1 euro a day towards the EU budget. The EU budget is equal to around 2% of the sum of the 28 Member States’ national budgets. 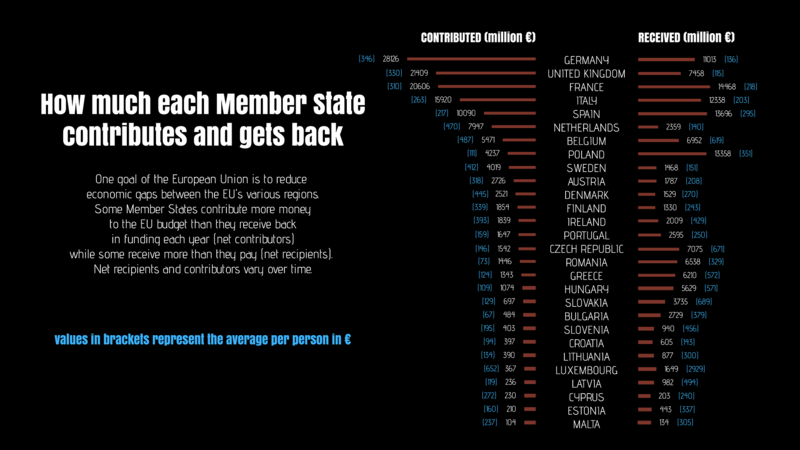 To put that into perspective, individual citizens contribute on average less than 1 euro a day towards the EU budget. The EU budget is funded mainly by contributions from the 28 Member States. About 94% of the money funds real activities on the ground that benefit European citizens, regions, cities, farmers, and businesses. 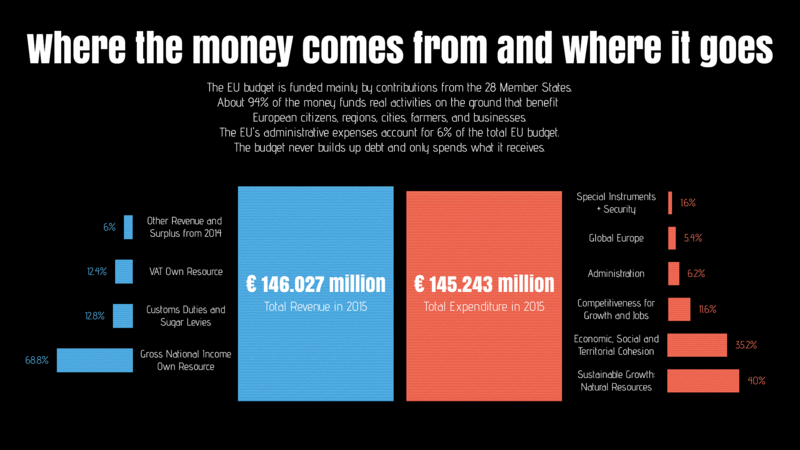 The EU's administrative expenses account for 6% of the total EU budget. The budget never builds up debt and only spends what it receives. One goal of the European Union is to reduce economic gaps between the EU's various regions. Some Member States contribute more money to the EU budget than they receive back in funding each year (net contributors) while some receive more than they pay (net recipients). Net recipients and contributors vary over time. We DON'T collect personally identifiable information (your IP address is anonymized). We DON'T use marketing cookies. We DON'T share information about usage of the website with advertisers. If you want to continue to visit this website without any data sent to Google Analytics, please click here. Otherwise please click OK. Thank you.